You might remember Phineas’ name from past Weetacon raffles, including the highly sought-after “Commie Reagan” poster. He was the visual face of Half Acre Brewery, whose beers have also graced several Weetacon raffles. His website, octophant.us, is choc-a-bloc with incredible artwork that you can purchase on everything from posters to T-shirts to phone cases. Even a pair of shoes featuring the Soviet cosmonaut dogs Belka and Strelka! Go check it out, it’s seriously cool. Among the subjects Phineas returns to most often are 1. hybrid animals (including his most famous creation, the Octophant — a part Elephant, part Octopus who is announced by the phrase “I Should Not Be…”), and 2. samurai. 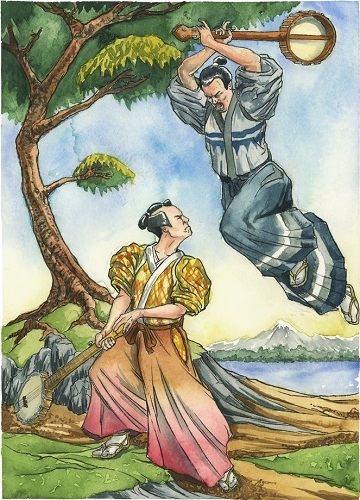 This 12″ x 16″ archival quality giclée print (suitable — and recommended — for framing) features a scene that combines “Deliverance” with “Yojimbo” and will bring joy and bewilderment to all who cross the threshold of your domicile of office cubicle.